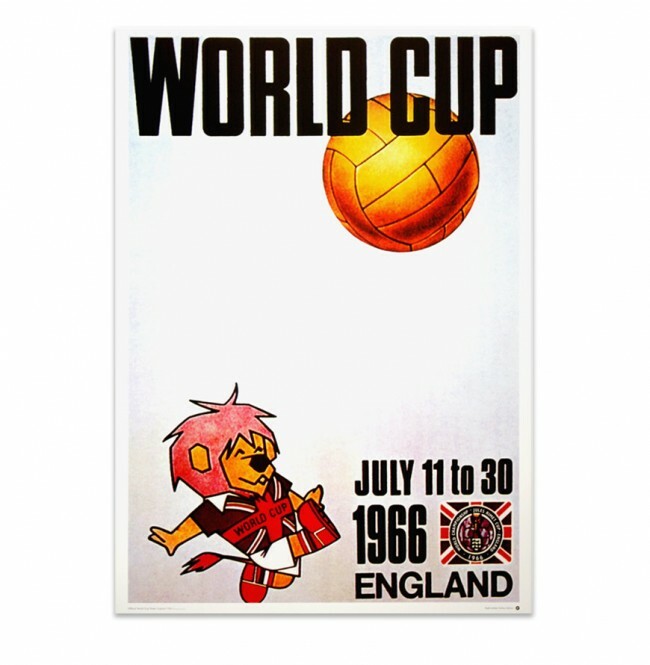 England played host to the 1966 FIFA World Cup TM. There was another new record number of entries for the qualifying tournament, with 70 nations taking part. FIFA ruled ten teams from Europe would qualify, along with four from South America, one from Asia and one from North and Central America. 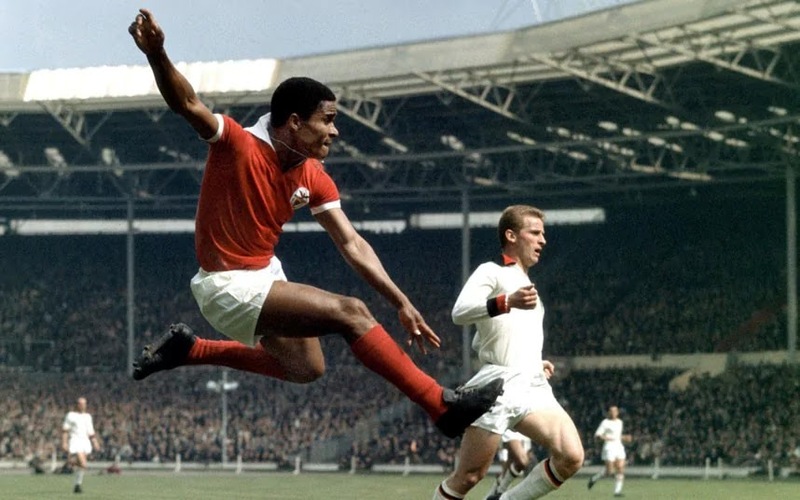 Thirty-one (31) African nations boycotted the tournament to protest a 1964 FIFA ruling that required the three second-round winners from the African zone to enter a play-off round against the winners of the Asian zone in order to qualify for the World Cup. South Africa was banned for violating the anti-discrimination charter (apartheid). Portugal and North Korea qualified for the first time. Prior to the start of the competition, the Jules Rimet trophy was stolen from an exhibition display. Fearing the trophy would be lost the FA commissioned a replica cup. 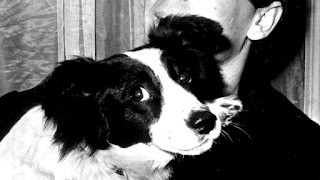 Then, it was reported the trophy had been found a week later when "Pickles" the dog, serendipitously found it hidden under a bush on his morning walk. 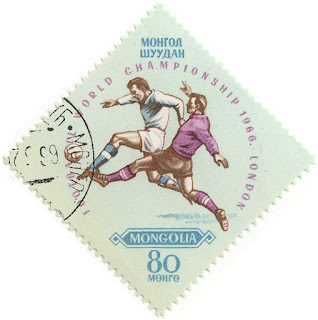 Eight stadium were used in the 1966 FIFA World Cup TM : Wembley and White City Stadium, London ; Old Trafford, Manchester; Goodison Park Liverpool; Ayresome Park, Middlesbrough; Hillsborough Stadium, Sheffield; Villa Park in Birmingham, and Roker Park in Sunderland. Wembley, the National Stadium was used for nine matches, including all of England's six matches, the final and the third-place match. Goodison Park was used for five matches; Roker Park and Hillsborough both hosted four matches. Old Trafford, Villa Park and Ayresome Park each hosted 3 matches and did not host any knockout round matches. Sixteen (16) teams qualified for the final tournament: Europe (England - hosts, Bulgaria, France, Hungary, Italy, Portugal, Soviet Union, Spain Switzerland, and West Germany), South America (Argentina, Brazil - defenders, Chile, and Uruguay), Asia (North Korea) and North and Central America (Mexico). Progress followed the same format, with the final 16 were divided into four groups of four. Each group played a round-robin format. Two points were awarded for a win and one point for a draw, with goal average used to separate teams equal on points. The top two teams in each group advanced to the knockout stage. In the knockout games, if the teams were tied after 90 minutes, 30 minutes of extra time were played. For any match other than the final, if the teams were still tied after extra time, lots would be drawn to determine the winner. The final would have been replayed if tied after extra time. In the event, no replays or drawing of lots was necessary. The 1966 FIFA World Cup TM was the first competition to embrace marketing, featuring a mascot and official logo, World Cup Willie (lion). 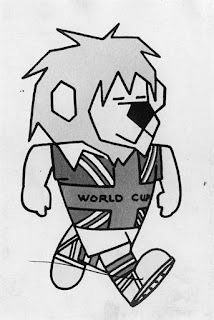 World Cup Wille wore a Union Flag jersey with the words "WORLD CUP" and was designed by freelance children's book illustrator Reg Hoye. Bill Titcombe made a comic strip about the character, and Lonnie Donegan released the campaign song' World Cup Willie' to correspond to with the tournament. Over one and a half million people (1,563,135) attended to games (48,848 per match). Not all of the games were televised despite both channels ITV and the BBC in operation. When all four quarter-finals kicked off at the same time on the same day only the controversial England-Argentina game was live. Dubbed ‘el robo del siglo (the robbery of the century) in Argentina, England scored the only goal of the game. 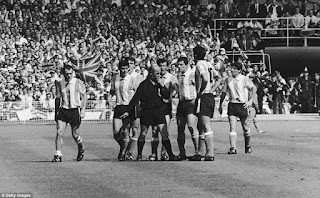 Antonio Rattín (Argintina) became the first player to be sent off in a senior international football match at Wembley. At first, he refused to leave the field and eventually had to be escorted by several policemen. The highlights of the other three quarter finals were shown later. 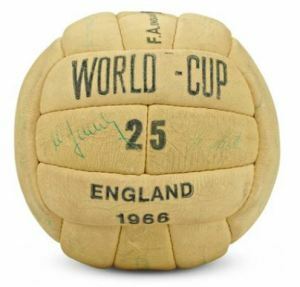 The 1966 competition ball was the challenge 4-star (Slazenger). It had the same structure as the 1958 Top Star Ball. The leather ball was used in a variety of colours including reddish brown in the final. 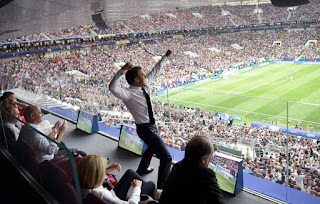 A total of 89 (2.78 per match) goals were scored which was far fewer than previous FIFA World Cups TM, as teams had learned to play tactically with defence in mind. The top scorer for the tournament was Eusébio da Silva Ferreira (Portugal), with nine goals to his name. The King (‘o Rei’), or The Back Pearl scored four goals in one game. Players accepted the lower soccer shoes was preferable to the old high-top boots. These were lighter in weight and when paying with new soccer balls speeded up the game. New synthetic polymers prevented uptake of water and both ball and boots remained the same weight throughout, event in the worst weather conditions. Black boots were essential. 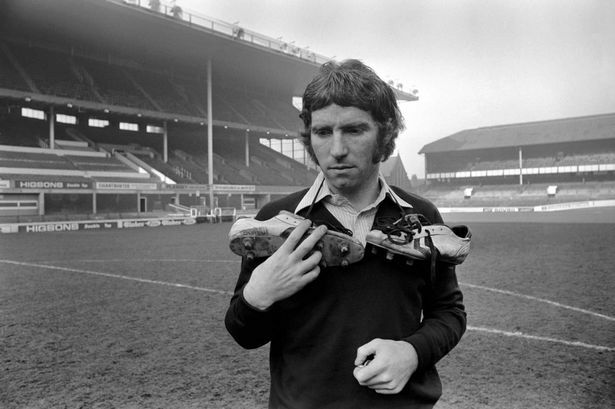 Three quarters of the English players wore adidas boots as sponsorship and personal endorsement became more common in the game. Photo opportunity became a crucially important marketing ploy. This in turn let, in some instances to players disguising their preferred soccer boots to look like the sponsor’s boot. Companies embarked on making more fashionable boots incorporating novelties which sometimes appeared to ignore the risk of personal injury. Popularity of the event was spreading worldwide as more people became aware of the competition through television. 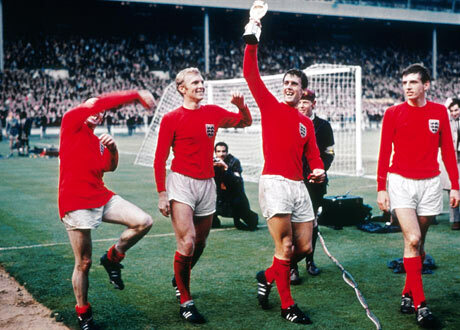 Whilst live colour broadcasts were another year away, the global viewer figures for the fina; of the 1966 FIFA World Cup TM finals were 32.3 million viewers. 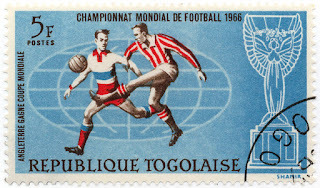 Several countries issued special commemorative stamps, including Mongolia and Togo (République Togolaise) . 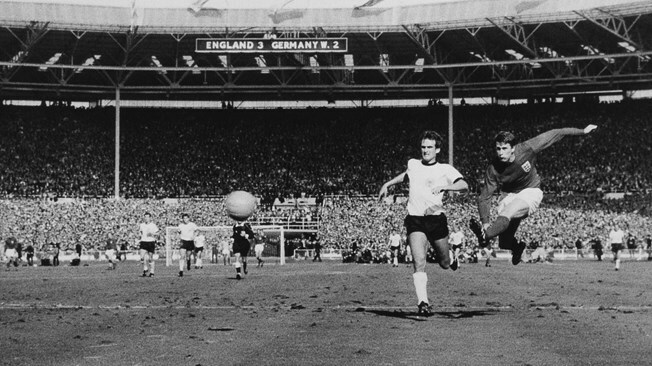 The final between England and West Germany took place in front of 98,000 people, at Wembley Stadium. 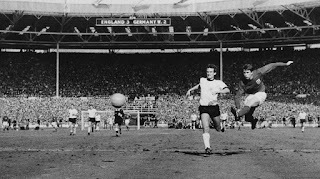 The game was tied in a 2 all draw when Geoff Hurst was credited with a controversial goal which even today is the subject of much debate. Minutes after the striker scored again to give England a 4-2 victory. 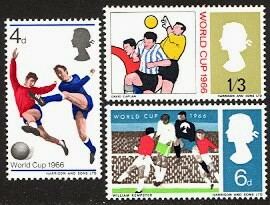 Geoff Hurst became the first and to this day the only player to score a hat-trick in a FIFA World Cup TM Final. The English player led by Captain Bobby Moore received the Jules Rimet trophy from Elizabeth II. This was the last final to be broadcast in black and white.
. 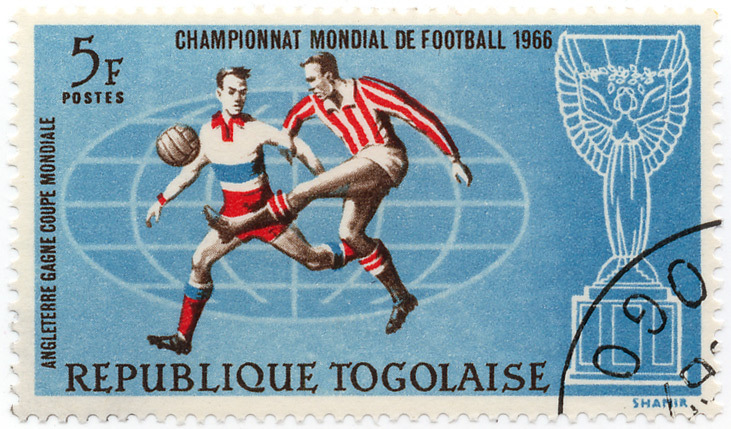 The final games of the 1966 FIFA World Soccer TM Championship were commemorated by a set of three stamps. 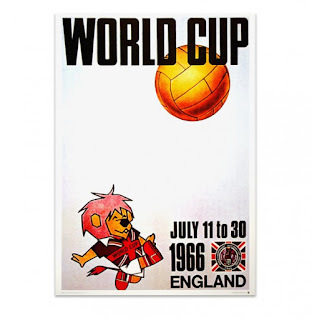 Issued by Great Britain on June 1, 1966.